PENA BAKAL GURU: Academic Competition is so LAMe!! Academic Competition is so LAMe!! The freaking inaccurate public examination; PMR has just ended and I could see all the people are proud of their school's ranking. Call me stupid, but I won't be bothered by my school's performance. Because I don't believe in how public examination reflects your intelligence. That's not just it. This kind of competition has ignore other elements that are important in creating a useful workforce. We just compete, and strive for the examination, and then we are proud of how many A's we have. 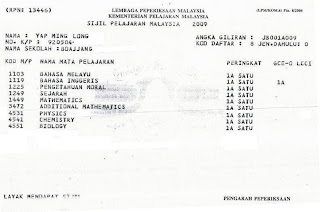 What a stupid kind of proud, when we have a freaking amount of A's but we have lack of soft skills. We ignore the soft skill competition. Our mom wants us to get all A's. Our teachers want ys to get all A's. The society wants us to get all A's. But no one want us to be a useful Malaysian that can talk, street smart and independent. ask your heart! what u want u will get that. p/s: oooppss! i'm forgetting i am teacher wanna be. not my fault rite?? just convey up my opinion. its come from my friend. if i am the leader of education ministry one day, i will change this system..